As I’ve said before, when I’m stressed, I bake. Preferably bread. On my latest out-of-town jaunt to check on my dear auntie, who has been ill, I felt compelled to bake a bunch of yeasty items the day before I left for Wisconsin. And one of these items was the English muffins in the The Bread Baker’s Apprentice: Mastering the Art of Extraordinary Bread . 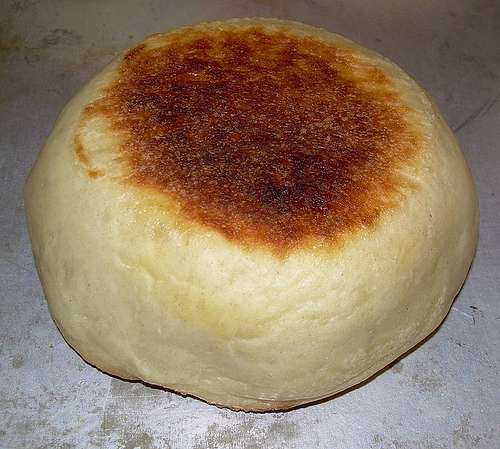 And, because I had never made homemade English muffins before, and I LOVE them, I was pretty excited to tackle this challenge. Unlike a lot of recipes in the book, there was no biga, or soaker. I used buttermilk, and the dough came together quickly and easily. 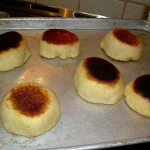 I loved shaping these little muffins, and they rose incredibly fast in my hot kitchen. As you can see from the photos, I cooked the first three a little too long on the griddle – the color I was shooting for was a deep golden brown, not black! 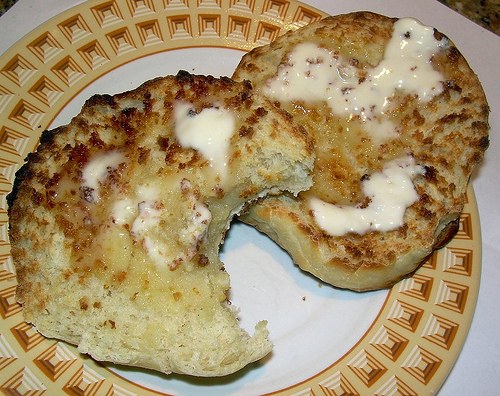 But the real test came when I split them open and toasted them – would they have nooks and crannies? Why, yes, we have some nook and cranny action! Maybe not quite as much as Thomas’s English Muffins, but as many as Wolferman’s. 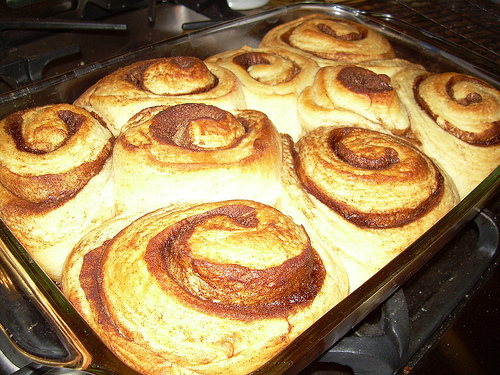 The bonus was that my husband loved these, and would like me to make them again. I thought they could use a bit more depth of flavor. What changes would I make? In the future, these will get an overnight rise in the refrigerator to give the dough a chance to develop some more flavor; I may even throw in some sourdough starter to get a bit more “tang.” In the end, though, these definitely go on the “repeat” list. FYI, you can see what everyone is making this week at our Flickr group, on Twitter (#BBA), or check out the challenge page. This bread has been YeastSpotted! Not Northern cornbread (sweet), but not Southern cornbread (savory), either. The next entry in the Bread Baker’s Apprentice group, which is baking it’s way through the book, is Peter Reinhart’s cornbread. FYI, you can see what everyone is making this week at our Flickr group, on Twitter (#BBA), or check out the challenge page. 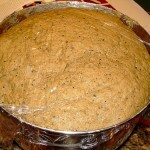 For the recipe, please see The Bread Baker’s Apprentice: Mastering the Art of Extraordinary Bread . 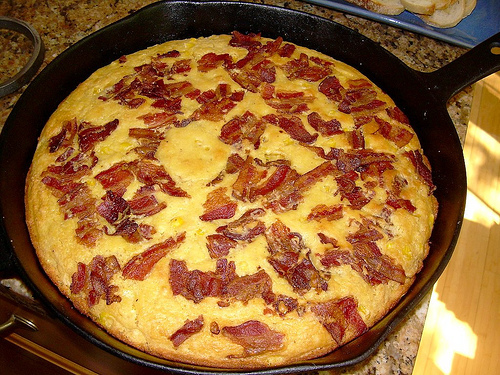 The recipe starts with a cornmeal/buttermilk soaker, and includes a full pound of corn and about 10 ounces of bacon. I baked the whole thing in my cast iron skillet, and ended up with a lovely deep golden brown crust on the bottom. The bread was surprisingly moist on the inside, and the crisp bacon topping provided a nice counterpoint to the sweetness of the corn. Both my husband, who prefers his cornbread so sweet that we call it “corn cake,” and our dinner guest (a born and bread Southerner) each had two pieces, and they were not small pieces. 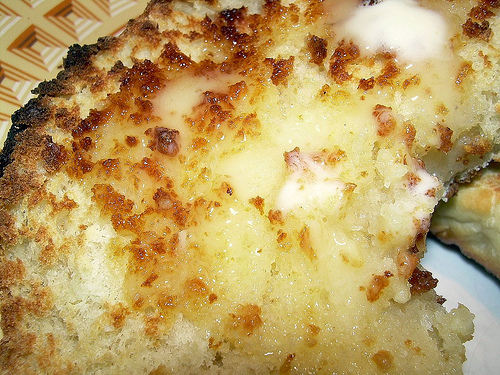 All in all, one of the better cornbread recipes that I’ve ever made, and one that I’ll keep in my repertoire. 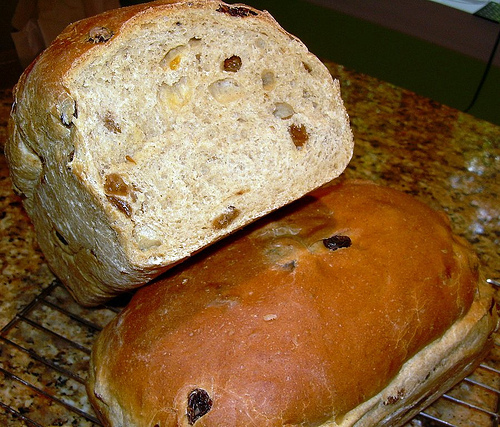 Next on the list for the Bread Baker’s Apprentice baking group is cinnamon raisin walnut bread. 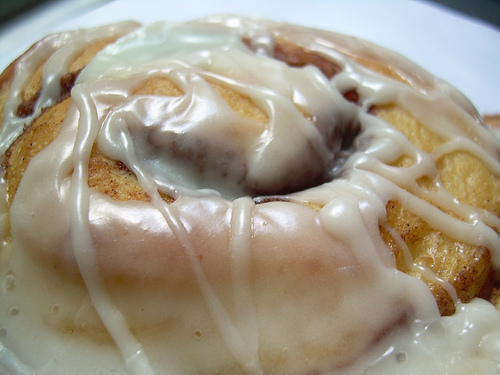 Now, things have been hectic around here, and it wasn’t until I had baked the bread and was munching it at my kitchen counter that I wondered where the wonderful cinnamon swirl was. The swirl that I’d seen over at Tanna’s blog. Why, it was in a sidebar to the main recipe, the sidebar that I neglected to read what with all my running about. I have to say that without all that added cinnamon crunch goodness, this loaf was . . . blah. It tasted too yeasty, and didn’t have enough flavor for me. 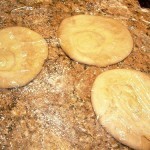 I did use half attah durum flour, and half white flour, buttermilk, and I eliminated the walnuts. 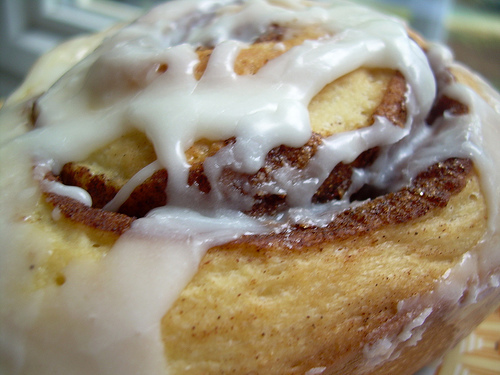 I plan on making the recipe again, this time with the swirl and LOTS of cinnamon! 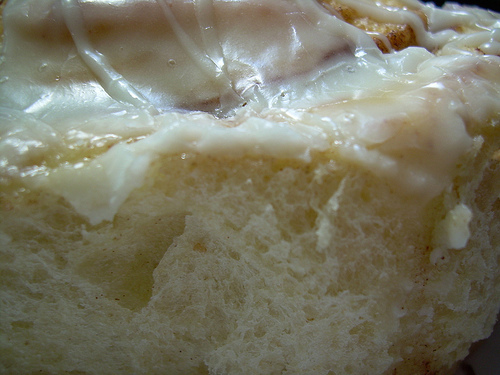 You can see what everyone is baking this week at our Flickr group, on Twitter (#BBA), or check out the challenge page. For the recipe, please see The Bread Baker’s Apprentice: Mastering the Art of Extraordinary Bread , or check out Google books. And I’m sending this in to Susan for her weekly YeastSpotting roundup every Friday. She’ll be back from Switzerland this week, and I’m eager to read about her trip. If you’re here for the Daring Bakers or Tuesdays with Dorie, I had to leave town on a family emergency. I did not get a chance to make and/or post for those events. I did, however, manage to bake a few things before I hit the road, so you’ll be seeing those posts on this blog. If I can manage to get some TWD in while I’m gone, I will! I think that baking, particularly baking bread, is a form of therapy for me. I love to bake, and then give most of it away. Rarely do I have more than a slice or a bite. Nevertheless, in the past couple of weeks, I’ve broken that pattern not once, but twice: first, with some cinnamon buns that I will be blogging about soon, and second, with these TOTALLY AWESOME Lebanese Tahini Swirls, Sukkar bi Tahin. 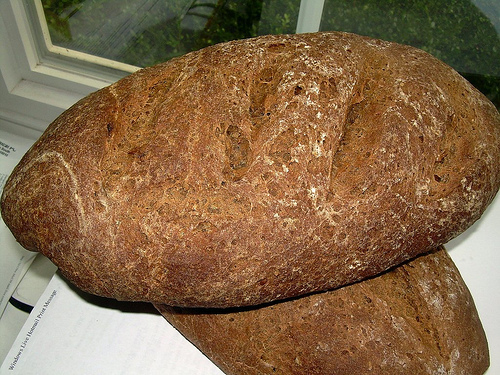 There is a group of bread bakers called the Bread Baking Gals who get together, bake a top secret bread, then invite anyone who is interested to join them. This month, Natashya of Living in the Kitchen with Puppies, picked a Lebanese yeasted flatbread called Sukkar bi Tahin, a type of flat roll filled with sesame paste and sugar, which caramelizes a bit when baked. Natashya found the recipe in Jeffrey Alford and Naomi Duguid‘s wonderful book, Home Baking: The Artful Mix of Flour and Traditions from Around the World . I baked these a few hours before I left for the airport because I had to make such an intriguing bread and, of course, I had to have a little bite. The recipe made six flatbreads and, honestly, I meant to have a nibble. Just a nibble. I ended up wolfing down an entire Sukkar bi Tahin, then I wrapped up two for my brother who was cramming one in his mouth as I shoved him out the door (I had to get to the airport, you see). My brother and I LOVED these, my husband, who prefers sesame in savory dishes, thought they were okay. The filling tasted almost like a crunchy peanut butter. I added a pinch of salt to the dough, and I’m glad I did – my brother would have liked more salt, but I thought it was just right. I will be making these again, and I will experiment with the fillings like some of the Babes did – Tanna filled some of hers with pesto! Be sure to check back with Natashya after August 1 to see her roundup of participants, and her post of these breads for a list of the Babes, and the recipe, including a metric version of it. My very slight adaptations to the recipe are after the jump. And this bread has been YeastSpotted! continue reading "Delicious Lebanese Tahini Swirls, Sukkar bi Tahin, from the Bread Baking Babes"
The Bread Baker’s Apprentice Challenge (BBA) is the brilliant idea of Nicole at Pinch My Salt. You can see what we’re baking this week at our Flickr group, on Twitter (#BBA), or check out the challenge page. For those of you who don’t know about it, we are baking everything in Peter Reinhart’s book, The Bread Baker’s Apprentice: Mastering the Art of Extraordinary Bread , in order. I must confess that, even though I post in order, I don’t necessarily bake these breads in order. Some days I don’t have the time for three rises, numerous turns . . . well, you get the idea. Well, so far this book is batting .1000. Everything I’ve made from it has been delicious, if not exactly visually appealing (my fault, not his). 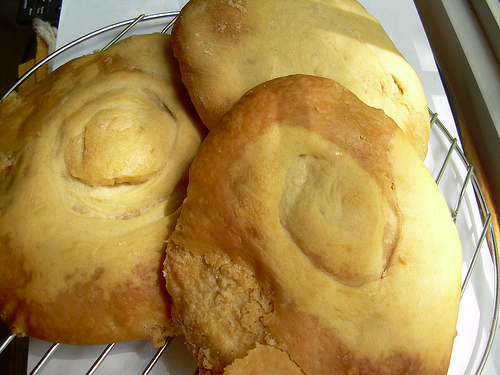 This time, I ended up with tasty challah AND beautiful bread that I shared with my neighbors. I followed the recipe pretty much (you can find it on line, here, but buy the book! 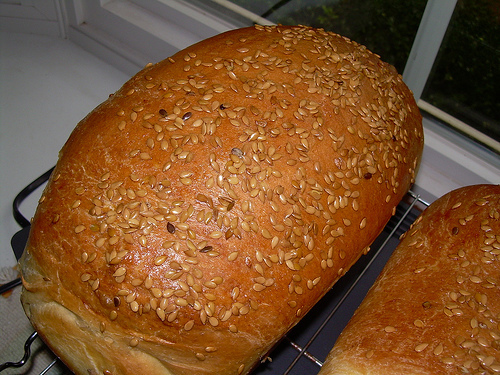 ), except that I subbed about 5 ounces of atta flour, and sprinkled the loaf with flax seeds because I couldn’t find my sesame seeds. Time to clean out that freezer! And I did not make any braids, just baked the dough in two 8×5-inch pans. 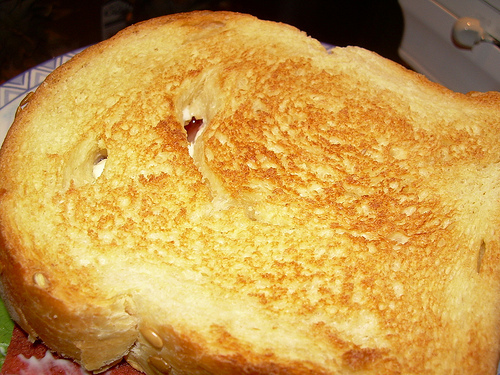 The bread was beautiful and made great toast and sandwiches, as you can see. If you’re wondering whether that’s bacon, the answer is no, it’s not – it’s Morningstar Farms Veggie bacon strips. Before you knock it, consider that my meat-eating, pork-loving husband finds that it is a highly acceptable stand-in for the real stuff. 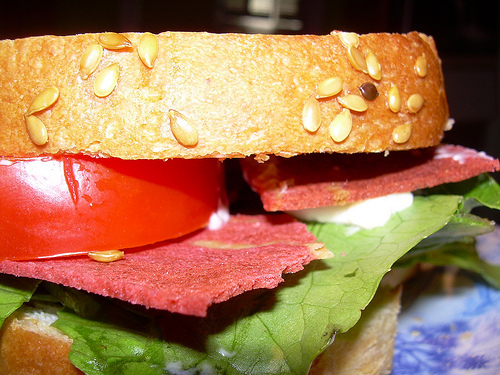 This sandwich was my breakfast the other day. Great way to start the morning, I must say. Next up: Ciabatta! And check out Susan’s weekly roundup of all things yeasty, YeastSpotting! 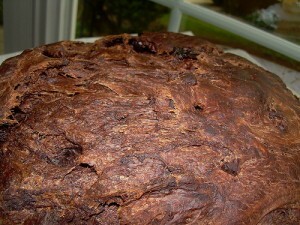 Chocolate Cherry Bread – Day 5 of Chocolate Week, and Bread Baking Day! I love it when I can do several things at once. 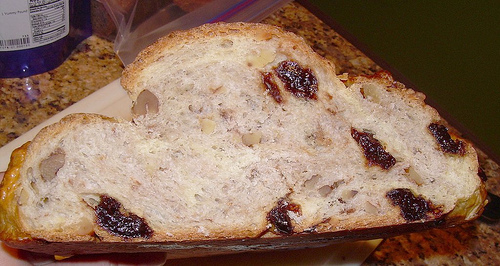 For example, blog about a chocolate cherry bread for Bread Baking Day (BBB), and that same bread uses ingredients that I had on hand (for Frugal Fridays), and closes out my week of chocolate! For BBB #22, our challenge is Sweet Breads hosted by Hefe und mehr. 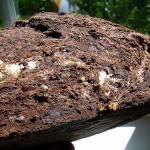 I tried chocolate bread for the first time about three years ago, and I wasn’t too impressed. A year or so later, I gave it another shot and bought a loaf from Wegman’s. 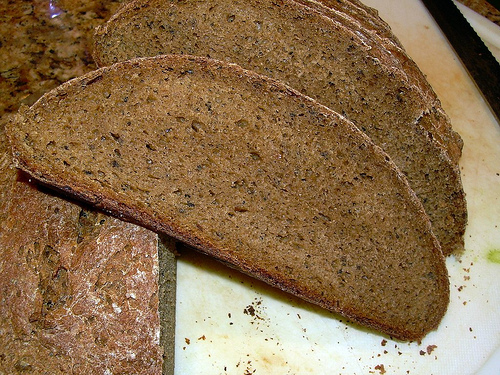 Now, that bread was really good – it tasted of chocolate with a faint sweetness in the background. They produce it seasonally, I think from December through February, and I decided to make some one day so that I could have a good chocolate bread whenever I wanted it. Enter Artisan Bread in Five Minutes a Day: The Discovery That Revolutionizes Home Baking, by Jeff Hertzberg and Zoë Francois. I’ve had the book sitting on my bookshelf for over a year, and it is full of post-its marking the breads I would like to try. But it was not until recently that I finally made something out of this wonderful book. Of course, I chose the Chocolate Bread for Chocolate Week. 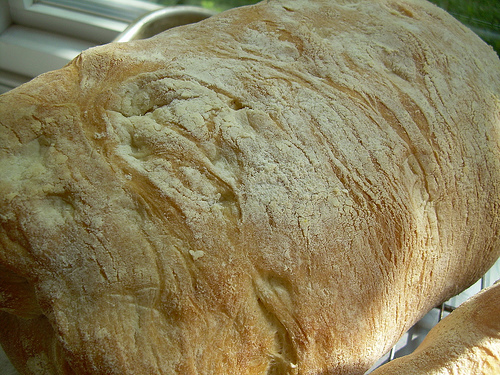 I had never made a no-knead bread before, so I had to mightily resist the Urge to Knead. 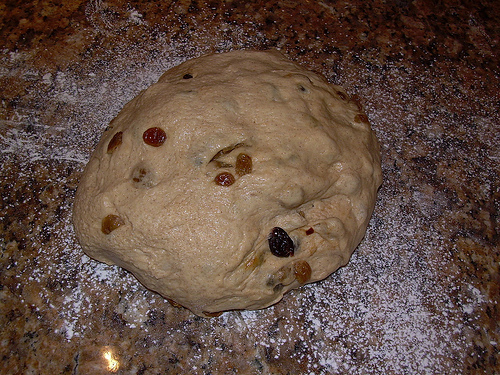 You see, I like kneading, but I like learning about different breads and techniques even more, so when I caught myself stirring a bit too much with a wooden spoon I stopped immediately, even though there were still a few streaks of white through the dough. 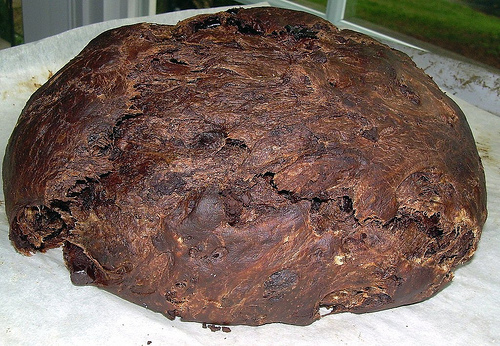 You see, this dough as a LOT of chocolate – 9 ounces of chocolate and a full cup of cocoa, so it’s pretty dark, and unincorporated flour really stands out. My thoughts on the bread: the chocolate flavor really comes through, so pick one that you like. 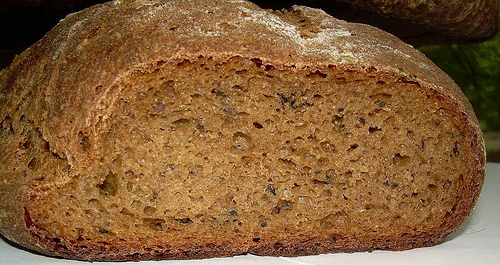 If you prefer milk chocolate, this bread may not be for you – it has the true intensity of bittersweet chocolate. I think using chocolate chips instead of the 5 ounces of chunks would work out fine. The bread was a tad too salty for me, so next time I might use just one tablespoon of salt. The cherries that I added were a nice bright counterpoint. 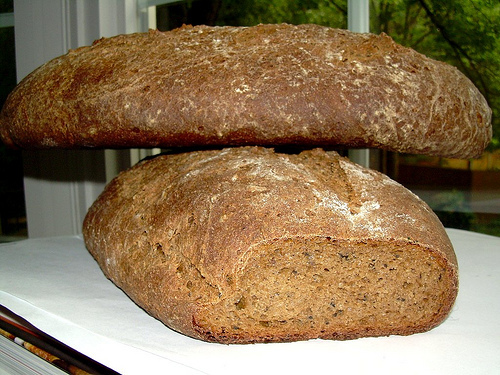 As for the texture, the the loaf was tender and very rich – I could eat only small slices. The crust was not chewy at all. I liked the bread with butter, and Nutella was fabulous on it. The original recipe says to bake it for about 35 minutes, but mine took 65 minutes to reach an internal temperature of 190 F. The loaf is on the repeat list, and I look forward to playing with the recipe a bit more. I was really amazed at how quickly and easily this bread came together, and I’m looking forward to trying more recipes out of the book. And be sure to check out Susan’s weekly YeastSpotting roundup every Friday – it’s a great source of inspiration and instruction for me and a lot of other bakers. Next Friday, Nick of imafoodblog will be hosting for Susan, so be sure to check out his blog. 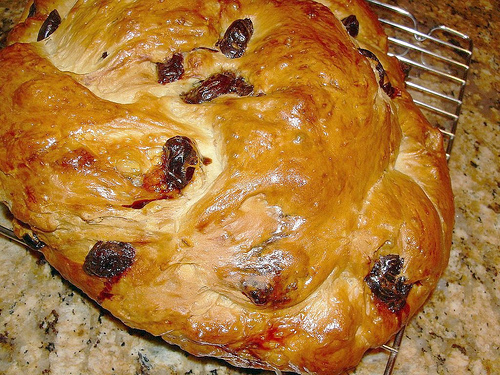 continue reading "Chocolate Cherry Bread – Day 5 of Chocolate Week, and Bread Baking Day!"